There’s a very popular monthly winner in this competition! 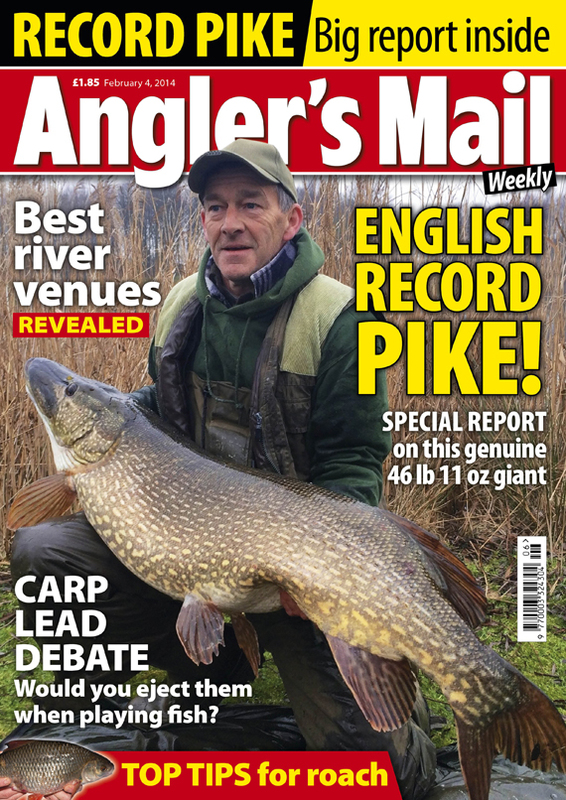 Find out who he is and why he’s won by reading this week’s Angler’s Mail magazine – on sale from Tuesday, Feb 4. 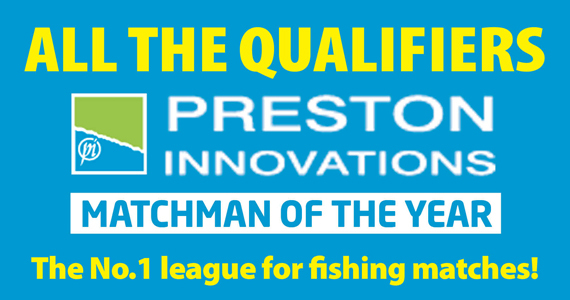 Preston Innovations-Angler’s Mail Matchman of the Year qualifiers – for full coverage on this competition see Angler’s Mail magazine every week! An angler from this region stars heavily! * Daiwa Hallcroft Silverfish WL, Retford, Notts. Sun, 32, Moat and Bridge island lakes. John Barningham (Harrison’s Tackle) 18-1-0, roach, perch and skimmers, dead maggot over groundbait at 10m, peg 13 Bridge island; Luke Sears (Daiwa Marukyu) 17-15-0; Nick Sears (Daiwa Hallcroft) 16-15-0; Gary Mumby (Team Frenzee) 16-8-0; Andy Oldham (Team Frenzee) 15-8-0. Teams: Team Frenzee; Daiwa Drawbags; Peg One Tackle (undisclosed points). * Embassy Racing York WL, River Ouse, Fulford. Sun. 42. Bob Morris (Angler’s World Holidays) 6-10-0, a bream and two roach, feedered worm; Trev Price (Tang Hall MG) 3-1-0; Tony Stephenson (Angler’s World Holidays) 2-13-0; Stan Haigh (Angler’s World Holidays) 2-10-0; Dave Young (Cochranes) 1-14-0. Teams: Angler’s World Holidays 15-4-0; X-Men 4-15-0; Cochranes 4-3-0. League: Angler’s World Holidays and X-Men both 5; Cochranes 12. * Garbolino Lindholme, Doncaster. Sun, 50, Bonsai, Willows and Oasis lakes. Chris Kitchen (Garbolino Lindholme) 62-13-0, F1s and silvers, bread and pellets, Willows 52; Nick Speed (Shimano) 44-13-0; Paul Yates (Drennan) 43-11-0; Dave Shires (West Yorkshire Police) 42-1-0; John Allerton (Tri-Cast) 39-11-0. * Leeds DASA, River Ouse, Hunters Lodge, Thorpe Underwwod and Widdington. Sun, 61. Tony Peel (Ultimate Barnsley Blacks) 4-9-0, ten roach, bomb and lob, peg 7; Scott Lister (Browning Quaker) 4-7-0; Paul Bennett (Tackle 2U) 2-12-0; Pete Lowther (Daiwa Dons) 2-4-0; Keith Hobson (Ultimate Barnsley Blacks) 1-14-0; Glen Brown (Pontefract) 1-10-0. * Tom’s Ponds, Ponds One and Two, Otley. Sun, 32. Lee Bramham (Otley) 55-15-0, carp to 6 lb, pellet at 14m, peg 5 Pond One; Andy Rawson (Keighley) 36-1-0; Kev Trevors (Pudsey Angling Centre) 35-7-0; Paul Tate (Tom’s Ponds) 34-7-0. * Valmaar Sideloaders, River Ouse, Hunters Lodge to Linton. Sat, 42. Andy Bradley (Mirfield) 4-9-0, 25 roach, feedered worm and maggot, peg 250; Martyn Highe (Mirfield) 4-2-0; Pete Barron (Tackle 2U) 4-1-0; Dean Grace (Pontefract) 3-8-0; Dave ‘Punky’ Armitage (Cleckheaton) 3-2-0. It’s essential reading this week. 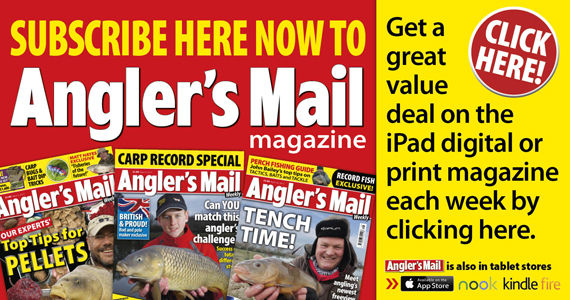 Be sure to get your copy of Angler’s Mail magazine. Ancholme Spring Series, River Ancholme, Springs, N. Lincs. Sun, 21. Graham Bontoft (Scunthorpe Tackle) 11-3-0, roach, bread punch, peg 14; Rob Cooney (Grimsby) 10-13-0; Graham Bachelor (Grimsby Bait 2 Fish) 9-1-0. Barnburgh, Doncaster, S. Yorks. Tues, 15, ovcer-50s. Andy Szczupak (Barnburgh) 37-6-0, F1s, poled pellet; Steve Sherburn (Barnburgh) 31-8-0; Roger Healey (Barnburgh) 28-0-0. Wed, 15. Pete Lakin (Barnburgh) 72-8-0, F1’s on poled pellet; Andy Szczupak (Barnburgh) 57-8-0; Andy Sutton (Rotherham) 46-0-0. Sun, 19. Mick Crookes (Barnburgh) 37-0-0, F1s, poled pellet; Paul Crookes (Barnburgh) 36-8-0; Paul Jenkinson (Barnburgh) and Paul Dolton (Sheffield) both 28-8-0. Bob-Co, Carpvale Match Lake, nr York. Sun, 13. Gary Miller (Bob-Co) 41-8-0, carp on corn from peg 37; Roy Worsnop (Bob-Co) 36-10-0; Graham Broadley (Bob-Co) 31-4-0. Daiwa Hallcroft, Retford, Notts. Mon, 12, vets. Bridge. Ian Temple (Retford) 38-3-0,carp and silvers, poled maggot and pellet, peg 53 Outer; Roger Holmes (Notts AA) 17-12-0; Nigel Wood (MAP Leegem) 11-0-0. Thurs, 25, vets, Moat. Roger Holmes (Notts AA) 41-4-0, carp, pellet feeder, meat and corn, peg 97 Outer; Mal Edgecombe (Doncaster) 40-0-0; Nigel Wood (MAP Leegem) 35-6-0; Lee Hewison (MAP Leegem) 32-12-0; Ian Temple (Retford) 32-2-0. Sat, 19, Moat. Andy Oldham (Frenzee) 44-14-0, carp to 9 lb, pellet feeder, punched meat, peg 64 island; Steve Robbins (MAP Leegem) 30-8-0; Rich Bonson (MAP Leegem) 26-9-0; Wayne Lomas (MAP Leegem0 26-4-0; Arthur Berisford (MAP Leegem) 20-0-0. Ferryboat Farm, Conisborough, S. Yorks. Sun, 14. Les Billups (Ferryboat) 8-6-0, mixed bag, pole and maggot; Steve Foster (Ferryboat) 6-0-0; Tony Brown (Ferryboat) 5-0-0; Ray Pinder (Ferryboat) 4-10-0. Garbolino Lindholme, Bonsai, Sat. 25. John Allerton (Tri-Cast) 55-4-0, carp, corn and pellet, peg 70; Steve Rothery (Daylite Baits) 29-11-0; Andy Mundell (Garbolino Lindholme) 22-3-0; Kev Holvey (Tri-Cast) 21-12-0. Hayfield. Doncaster. Sun, 24, Dannys Island Lake. Jeff Wilde (Fishing Republic) 120-10-0, carp on pellet feeder, peg 59; Tony Briscoe (Hayfield) 111-8-0; Craig Jones (Hayfield) 67-5-0; Sean Saunders (Hayfield) 49-0-0. Kiveton Hall, Sheff. Sun, 8. Colin Hendley (Kiveton) 71-2-0, carp, pole and pellet, peg 15; Steve Gill (Kiveton) 24-6-0; Paul Burt (Kiveton) 18-4-0. Leeds DASA, Kippax Ponds, Leets. Sun, 15, Lapwing Pond. Tom Barker (Allerton Bywater) 37-0-0, carp and barbell, maggot, peg 9; John Brogden (Leeds) 34-0-0; Steve Hodson (DH Angling RSPS) 15-9-0. None Go Bye Farm, near York. Sun, 21. Tim Peters (Tri-Cast Calder) 31-14-0, skimmers, pellet at 13m, peg 7; Ben Scott (Guiseley Angling) 24-12-0; Chris Kendall (Middy) 24-7-0. Oaks, Sessay, N. Yorks. Tues, 18, Sycamore Lake. Pete Whale (Oaks) 40-3-0, carp, pellet, peg 16; John Clarke (Oaks) 30-9-0; Simon Medd (Daiwa Cleveland Angling Centre) 16-7-0. Wed, 12, Firs, Alders & Willows lakes. John Maddison (Browning Quaker) 31-14-0, roach and skimmers, caster and pellet, Firs; Ian Bayley (Woodlands Tackle) 30-4-0; Josh Newton (Browning Quaker) 28-12-0. Thurs, 17, Cedar. Rob Minikin (Sonubaits) 60-0-0, F1s, pellet, peg 29; Chris Kendall (Middy) 37-11-0; Ant Stock (Daiwa Cleveland Angling Centre) 35-13-0. Sat, 25, Cedar. Stuart Stott (Starbeck) 28-5-0, F1s, pellet, peg 70; Andy Barker (Oaks) 27-12-0; Rob Harbour (Oaks) 24-4-0. Sun, 12, Ash, Beech and Sycamore. Chris Watson (Oaks) 39-8-0, carp, pellet, Sycamore 21; John Clarke (Oaks) 38-6-0; Ray Singh (Garbolino Elton) 24-7-0. Silstar Stainforth Angling WL, Pines Lakes, Thorne. Sun, 26. Keith Watson (Silstar Stainforth Angling) 89-6-0, carp to 15 lb, bomb and corn, peg 10; Jamie Snedker (Silstar Stainforth Angling) 48-12-0; Andy Renton (Daiwa Dons) 35-6-0. Pairs: John Walkden and Keith Watson 3; Andy Renton and Daz Hall (Thorne) 8. Wed, 10. Big Mark Price (Silstar Stainforth Angling) 48-2-0, ide, pole and maggot, peg 11; Jim Evans (Clay Lane) 32-10-0; Danny Evans (Clay Lane) 23-10-0. Sykehouse Fishery. E. Yorks. Wed, 20. Ron Hall (Hull) 74-4-0, carp, maggot feeder, peg 23 Twin Isles; Brian Werritt (Askern) 54-11-0; K Bull (Hull) 40-10-0. Sun, 23. Dave Chadwick (Hull) 78-0-0, carp on bomb and corn, peg 22 Twin Isles; M Howton (Hull) 48-4-0; Neil Yates (Hull) 43-1-0. Thornhill Pairs, Calder and Hebble Canal, Dewsbury. Sat, 24. Mick Sharpe (Thornhill) 4-7-8, skimmers and roach, bloodworm and caster at 12m, peg 19; John Needham (Leeds Angling Centre) 4-4-0; Craig Ellis (Tri-Cast Calder) 3-13-0. Pairs: Mick Sharpe/Brian Kellett (Thornhill), Keith Marshall/Craig Ellis (Tri-Cast Calder) and Daz Kershaw/Simon Walton (Matrix Halifax) all 10. League: Craig Ellis/Keith Marshall 27; Mick Sharpe/Brian Kellett 25. Wakefield, Calder and Hebble Canal, Calder Grove, W. Yorks. Sun, 18. Steve Allinson (Tri-Cast Calder) 2-11-0, roach and perch, bloodworm, peg 12; Warren McLeavy (Tri-Cast Calder) 2-10-0; Daz Kershaw (Matrix Halifax) 2-6-0. Woodhouse Grange, AKA ‘Dog Kennel’, Doncaster, S. Yorks. Wed, 12. Ghost. Barry Oliver (Yorkshire Baits) 67-0-0, carp on poled pellet, peg 2; Graham Webster (Doncaster) 45-0-0; Stef Huntington (Goole) 43-2-0. Thurs, 10. Cobble. Ian Taylor (Cats and Dogs) 31-7-0, carp on poled pellet, peg 5; Malc Scott (Goole) 24-8-0; Chad Taylor (Woodhouse Grange) 13-6-0. Sat, 15. Kingfisher. Keith Sanders (Woodhouse Grange) 42-10-0, carp on poled pellet, peg 4; Bernie Larder (Woodhouse Grange) 39-8-0; Mal Scott (Goole) 38-5-0. Sun, 22, WL, Dog Kennel and Ghost. Dave Swift (Woodhouse Grange) 59-0-0, carp on poled pellet, peg 35 Dog Kennel; John Pearson (Woodhouse Grange) 39-2-0; Mal Scott (Goole) 38-6-0. Yarm, River Tees, Yarm, Sun. 23. Ian Lumb (Yarm) 6-0-0, a bream and a perch, worm, peg 185; Mark Arrowsmith (Maver Newman Scotts) 4-12-0; Gerry Bowes (Yarm) 2-5-0.